About "Add and subtract mixed numbers"
Here we are going to see some example problems to understand how to add and subtract mixed numbers. To add or subtract two or more mixed fractions, we have to combine the whole part and combine the fractional part separately. Now we have to combine the fraction part, that is 5/6 and 1/4.Since the denominators are not same, we have to take L.C.M. 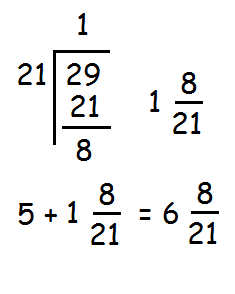 Now we have to combine the fraction part, that is 1/3 and 2/5.Since the denominators are not same, we have to take L.C.M. Hence the answer is 7 11/15. 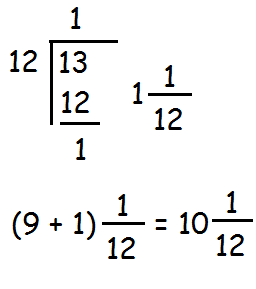 Now we have to combine the fraction part, that is 7/8 and 1/4.Since the denominators are not same, we have to take L.C.M. 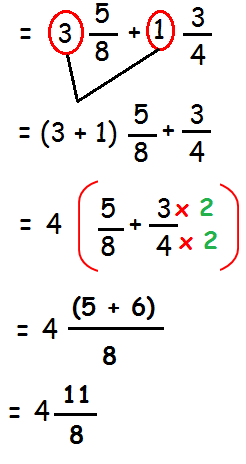 Now we have to combine the fraction part, that is 2/3 and 5/7.Since the denominators are not same, we have to take L.C.M. Hence the answer is 6 8 /21. 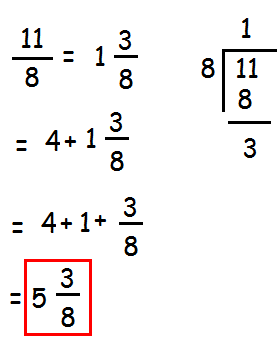 Now we have to combine the fraction part, that is 4/5 and 1/3.Since the denominators are not same, we have to take L.C.M. Hence the answer is 4 2 /15. After having gone through the stuff given above, we hope that the students would have understood "Add and subtract mixed numbers".